PortaFab offers the widest variety of cleanroom wall panels in the industry in order to accommodate a variety of modular cleanroom applications. We will be happy to provide a customized quote based on your specific requirements and application. Please fill out our Request a Quote form in order to get the process started, or read below for more information on our wall panels. 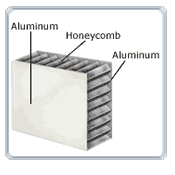 Aluminum honeycomb panels tend to be the most popular wall panels chosen for microelectronics cleanrooms because of they are non-outgassing, non-particle shedding, and anti-static as well as lightweight and non-combustible. Pharmaceutical applications require panels that can be washed continuously without breaking down while architectural finishes withstand repeated cleaning and sanitization with various chemicals to resist microbial and fungal growth. Alternate surfaces and cores, however, are available to meet the requirements of any type of cleanroom application. Surfaces offered include melamine, vinyl, painted steel, stainless steel, Fiberglas™ reinforced plastic (FRP), polyvinyl chloride (PVC), high pressure laminates, and porcelainized steel. As the best selling wall panel in our inplant office line, the Standard Fire & Sound has proven to be a successful and cost effective option for many cleanroom applications. The durable vinyl surface is easy to clean and has a very attractive appearance. 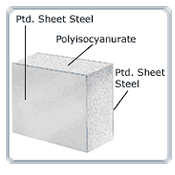 It features a polystyrene core that provides excellent thermal insulation and sound deadening properties along with a layer of gypsum that helps it achieve a class A noncombustible rating. Panel Thickness 2" 3" 4 5/8"
Fire & Sound panels with steel surfaces are ideal for areas subject to a significant amount of traffic or exposure to hand trucks, forklifts, or other material handling equipment. These insulated metal wall panels come with one or two 24 gauge steel surfaces and have excellent sound deadening and thermal insulating properties. The painted steel panels are extremely durable and can be painted champagne, gray, or white. Like all Fire & Sound wall panels, they are non-combustible. 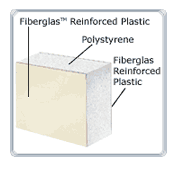 Fiberglass Reinforced Plastic (FRP) Wall Panels are ideal for any cleanroom that will be exposed to a great deal of moisture or require extensive cleaning with harsh chemicals. Typical applications include laboratories, pharmaceutical cleanrooms, and environments subject to FDA regulations. 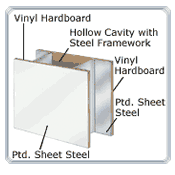 FRP panels can be outfitted with moisture resistant gypsum board if required. These popular panels withstand repeated cleaning and sanitizing with various chemicals to resists microbial and fungal growth. They are non-outgassing, non-particle shedding and anti-static as well as lightweight and non-combustible. Totally non-combustible wall panel with excellent thermal insulation. 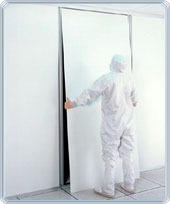 Alternate surfaces and cores are available to meet the requirements of any type of cleanroom application. Surfaces offered include melamine, vinyl, painted steel, stainless steel, Fiberglas™ reinforced plastic (FRP), polyvinyl chloride (PVC), high pressure laminates, and porcelainized steel. Panel cores are available in expanded polystyrene, paper honeycomb, aluminum honeycomb, gypsum, isocyanurate, and mineral wool. Special hollow walls provide air return channels for cleanroom applications. Please fill out our Request a Quote form in order to get the process started.